Anonymous Women: Draped is one of four new exhibits at the Daura Gallery. Check this interview with photographer Patty Carroll in The Burg. At first sight Patty Carroll’s faceless portraits appear to be a colorful variation on the themes of role-plays and domestic decor, literally enveloping the subjects in a never ending flow of patterned textiles. 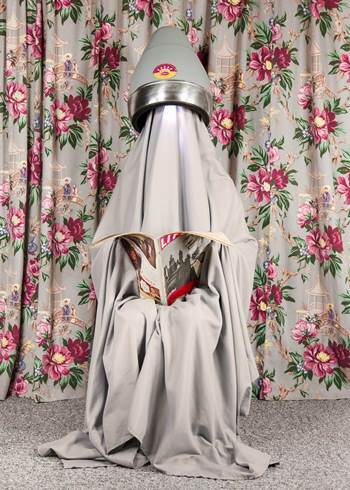 On a closer look however, Carroll’s thoughtfully choreographed photographs conjure up other familiar images — the habit of a nun, the burka or a type of urban camouflage — while her powerful evocation of overloaded interiors challenges the idea of home as a sanctuary, a haven of individual freedom. If Carroll’s often witty or ironic use of accessories associated with the idea of home and comfort inject an effective dose of subversion in her symbolic representations, her images also confront the viewer with questions of feminine identity and the nature and expressions of a double-edged domesticity. It is precisely in this constant tension — between the sensuality of the textiles and the claustrophobic sensation that emanates from their display, between the harmony of the compositions and the obsessive longing for perfection — that Carroll’s Anonymous Women: Draped continues to intrigue and seduce us. Carroll’s work is in the collections of major institutions such as the Museum of Modern Art, New York; Art Institute of Chicago and Museum of Contemporary Art, Chicago; the Smithsonian Institution and Library of Congress, Washington, D.C.; and the Bibliothèque Nationale, Paris. She lives and works in Chicago, and serves on the faculties of both the School of the Art Institute and Columbia College Chicago. “Anonymous Women: Draped” by Patty Carroll is organized by Foto+Synthesis. Images are reproduced by permission. The artistic and cultural legacy of West and Central Africa is presented within the contextual themes of Authority, Ritual and Rites of Passage. Sculpted artworks — including masks, figures, divination and ceremonial objects and musical instruments — represent elements of divination and initiation ceremonies, bestow power on their owners, and serve as altars to mediate between humans and the divine. The exhibition illustrates how African societies have used visual forms to embody the world of ideas and beliefs, resulting in imaginative and visually exhilarating works of art. By the 4th century CE, Christianity was flourishing in the east African kingdom of Ethiopia. As an integral part of their forging and embracing the ideology of Old Testament devotion and leadership, the faithful founded monasteries that played an essential role in the dispersion of Christianity as the Aksum emperors expanded their territories. It was in these centers of learning where devotional art such as illuminated manuscripts, icons and processional crosses were created by monks for their patrons: abbots, nobles and emperors. Relying initially on predominantly Byzantine models, by the 15th century Ethiopian panel-painting rivaled the Orthodox icons of Byzantium and the altarpieces of Renaissance Italy. Over time, they infused their work with their own distinctive idiom favoring bold colors and two-dimensional abstract design. Although Rockwell Kent (1882-1971) thought of himself first as a painter, his black-and-white wood engravings and book illustrations made an enduring contribution to American art. The least known of Kent’s works are the more than 160 bookplates he designed between 1910 and 1968. A bookplate or ex-libris [Latin, “from the books of…”], a small decorative label pasted into the inside front cover of a book, identifies its owner. In the 1920s and ’30s, bookplates were at the height of their popularity, and there was great prestige to having one’s own bookplate designed by Kent. In the 1940s and ’50s, when Kent’s realist art fell out of favor and his socialist politics made him an easy target of John Foster Dulles and Joe McCarthy, he described himself as desperately poor and relied on bookplate commissions to help support his modest way of life in upstate New York. In his last years, it was only the occasional bookplate commission that brought assurance that he and his art hadn’t been entirely forgotten.